Over the past decade, Singapore’s local booksellers and publishers have worked to put the city-state’s literary scene on the map. Now, amid a revival of book and magazine publishing, its young creators take stock of the progress that’s been made and ready themselves for the challenges of the future. “Days Of Being Wild” is a book by Dana Lam about the opposition political parties during the Singapore General Elections of 2006 that was published and designed by Ethos Books. This is interesting on various aspects, firstly, it is a book about the opposition political parties in Singapore and secondly, it has an interesting design background. According to Mr Fong Hoe Fang, the founder of Ethos Books, the book was not very well-publicised by the local media nor well-stocked by local bookstores because of its content. That aside, just by looking at the cover and the first page, some interesting design concepts appear. The juxtaposition of the massive crowd gathered to hear a rally by an opposition party against the riot police sets up the theme of opposition. In the pages of the book, the way the text is set allows for what Mr Fong calls “a-story-within-a-story”, the blue words belong to the author but the red words are quotes from people on the streets. I stumbled upon Kopi Kat Klan, a lost local band, when a friend couldn’t stop gushing and giggling about this really sweet song by them, “Ice-Kachang”, so she googled and found “Why You So Like Dat”. Truly authentic lyrics that only a Singaporean can understand. 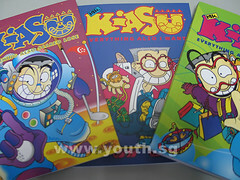 “Mr Kiasu” comics has got to be one of the most recognisable local icons that eventually died out. I always wondered what happened to it and I found that Youth.SG actually tracked Mr Johnny Lau, its creator, down and interviewed him about Mr Kiasu, why it stopped and what he has been doing ever since. I classified these three items under “Lost Local Things” because many of these things have never been recognised as truly Singaporean by the government, yet when I tell fellow Singaporeans about it, they nod in agreement about how Singaporean it is. These things become lost because they engender taboo topics as determined by the government: Singlish and opposition political parties. This is just the tip of the iceberg of what is lost, now if only more of us will start digging and start remembering what it means to be a Singaporean. In a week, I’ve attended the Singapore Design Festival, Singapore Writers Festival (poorly designed site) and the 10th anniversary of The Substation’s Movings Images program (it’s still on!) and I would like to make these observations. This was most evident in the seminars I attended as part of the Singapore Writers Festival. I came away most from Mr Fong and Mr Raman Krishnan, a independent book publisher in Malaysia. These two speakers knew why they were in the business and were more than willing to share their thoughts on issues, unlike some of the other speakers who most of the time gave really general answers. It definitely helped that both were championing local works and Mr Raman Krishnan also spoke about how Singaporeans and Malaysians knew little about each other’s talents despite the commonality in culture. They definitely inspired me because they were not just in things for the money. Especially when it comes to design, put aside all the frills and then the question to answer is, have you got your basics right? There was this pair of chopsticks in the “Iamacreativeperson” exhibition (which was a rip-off as compared to Utterubbish) that was elevated on one side so that the ends do not touch the table for hygiene purposes. However, that would mean the user has to consciously place it on the elevated side for it to be effective. I thought that really defeated the purpose of the design by simply not solving the problem and instead added a layer of complexity. This one came about after watching Hosaywood.com’s Zo Gang (Hokkien for Do Work) and Zo Hee (Hokkien for Do Film) and I was wondering to myself if the portrayal of Singapore culture in films was increasingly being monopolised by a group of select film-makers, often English-educated Chinese, who focused on topics like lampooning the government, championing Hokkien and Singlish, and focusing on the underbelly of Singapore. What about the rest of our culture, for instance our other races, our history, our politics… I think institutional checks like The Films Act are in a way limiting the diversity of films produced here. Ironically, in order to comment on politics, films have to portray it in a less “serious” form to engage the audience and escape getting in trouble with the government. This dumbs down the political engagement of the audience and also defeats the government’s call to take politics seriously.